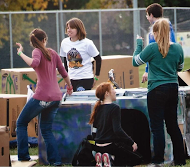 Citizens of the Billings community help each other make cardboard box homes on the Rocky practice football field. A city of highly decorated cardboard boxes rises south of the Bair Science building the night of October 11 to increase RMC and community awareness of homelessness. Rocky Mountain College is teaming with Family Promise of Yellowstone Valley to host the annual Cardboard Box City (CBC) for the third year in a row. FPYV is a network that assists homeless and low-income families to attain sustainable independence. Participants ranging from church youth groups to little league teams will spend the night outside, away from comfortable beds and warm homes, to sleep in a cardboard box. In its eleventh year, the event raises awareness for homelessness in the Billings area. Homelessness is a multidimensional issue needing multidimensional resources to relieve it. Some have argued that sleeping in a box in a safe location, near friends and family while participating in fun activities, is not an effective way to develop an understanding of homelessness. Business Professor Karen Beiser, who helped to host and organize the program, is familiar with the mixed messages of the event. “Homelessness is dangerous and damaging. CBC cannot fully empathize with those issues and the reality of it all, so the night is aimed at raising awareness, education, and assistance,” she said. Two young Billings community members are caught in action as they are putting together their adjoining cardboard box homes. Organizers of CBC have had to find a balance between addressing the solemn realities of homelessness while developing meaningful activities that make participants want to be involved. Every year, CBC includes a soup line and testimonies from people who have been homeless and received help through FPYV. This year, organizers will also be working with The Salvation Army to make sandwiches and emergency kits that will be distributed to the homeless in Billings. “RMC is part of this community far beyond its mission to educate–we are neighbors,” said Beiser. “We want the community to understand that we feel strongly about the issue of homelessness, and as educators, we want our students to develop a sense of responsibility to the world around us. “It is naive to assume this is someone else’s problem–homelessness can happen to anyone, and we want to be part of the solution,” she said. “On a very personal note,” Bieser added, “One of my own reasons for getting involved goes back to my dear friend and our former chaplain, Kristi Foster. Before she passed away, she convinced me to join her and a couple of students to spend the night in a box learning about homelessness. Working with over 1400 volunteers, the FPYV network provides shelter, food and employment placement to families, including those with children from infants to 17-year-olds facing life on the streets. If you would like to be involved with Cardboard Box City, student volunteers are needed for hosting the event and leading short-term activities. For information, contact Tessa Fraser at tessa.fraser@rocky.edu. A young Billings community member smiles for the camera as she promotes awareness for homelessness in Billings.